When English nurse, Lib Wright, arrives in rural, impoverished Ireland, her unusual task is to observe a ‘fasting child’: eleven-year-old Anna O’Donnell claims not to have eaten food for four months, refusing all meals and surviving instead on "manna from heaven". Lib, trained under Florence Nightingale, has been sent strictly to observe, but not to treat, or to diagnose – and she shares her shifts with a local nun. Anna and her family are devout Catholics, highly religious and superstitious. Visitors flock from around the world to meet Anna, hoping this miraculous child can cure their ailments. Lib, a meticulous nurse and sceptical non-Catholic, is initially convinced that the whole thing is a hoax, perpetrated by the family. However, as time progresses, and Lib spends more time with Anna, she is less certain, and her focus shifts to a desperate attempt to save Anna's life. The action takes place in the “forgotten middle” of Ireland – the wet and soggy bog lands – just after the end of the potato famine, when almost one million people lost their lives. Donoghue’s writing is wonderfully vivid and compelling, and her rich descriptions transport the reader to another world: the dreary weather, the damp and untamed countryside, the superstitious townspeople and the plain, unappetising food all create such a palpable atmosphere. 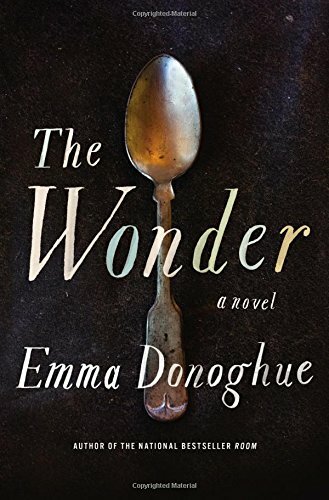 I read this book while I was on holiday in Ireland, in a small rural village in the west, and the language of Donoghue’s Irish characters really resonated with me – her colloquial expressions and phrases could not have been more accurate. The blurb on the back cover describes this book as a ‘psychological thriller’, but I disagree with that label – the word ‘thriller’ is too fast-paced for The Wonder. It’s quite a slow moving book in parts, especially the first half of the book, and its beauty lies in the descriptions and the atmosphere that is created, rather than in the fast moving turn of events. The pace picks up in the second half, when the focus turns to uncovering the mystery of Anna’s fasting; for me, the ‘page-turner’ description kicked in at that point.